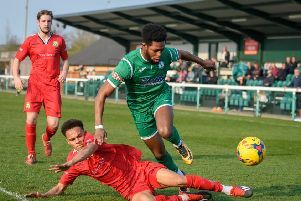 A scintillating first half saw Biggleswade FC close the gap on the leaders with a fine 2-0 win over second-place Hadley on Tuesday at Langford Road. The impressive midweek attendance of 165 were treated to FC at their devastating attacking best at times in the first half and also two brilliant goalkeeping displays from home Ross Tompkins and Hadley’s Luke Ward. With Hadley having not lost since mid-December, which was also to FC in the reverse fixture, a win was probably more important for the home side to arrest their visitors’ fine run. The game started at a frenetically high tempo with both teams eager to get in an early blow. FC headed just wide in the opening minute following a pinpoint Ryan Inskip free kick, whilst Hadley caused a bit of a scramble in the FC box from a long throw soon after. The opener arrived on 20 minutes. Some good work in and around the box saw Cookman find Alex Marsh and his attempted pass/shot across the face of goal was diverted into the right hand corner by a Hadley defender for an own goal. The visitors were fortunate to have a goalkeeper on top of his game behind them and Ward pulled off a save that would’ve been talked about over and over again at the highest level. Another eye-catching give-and-go between Alex Marsh and Adam Hunt on the edge of the box saw the latter bend a stunning effort with the outside of his right boot towards the top corner. It looked in from the moment it left his boot, but somehow Ward flung himself acrobatically with an arm at full stretch to tip the shot on to the frame of the goal. Despite Ward’s best attempts, he could do nothing to stop a now rampant FC side doubling their advantage on 28 minutes. Pat McCafferty’s pass into the feet of Marsh was delicately flicked around the corner for the surging Tom Coles to burst into the right hand side of the penalty area. 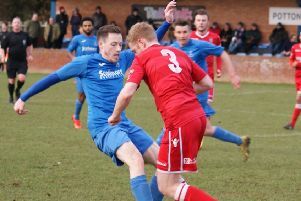 His strike had goal written all over it as he lashed a low drive towards the left hand corner – Ward parried but Lee Northfield was there to ram home his 19th goal of the season from the follow-up. With FC taking their two-goal cushion into the interval, the onus was on Hadley to try and force a way back into the game and they started the second half brightly. Though some of their early play was loose, Biggleswade were not about to open the door for a Hadley comeback and it was the home side who had the next two chances of note. Alex Marsh went on a solo counter-attack and tried an extravagant lob from distance, but the ball went harmlessly wide and then Tom Coles stooped to head an Adam Hunt cross goalwards, but Ward was there once more to tip the ball over. The Bricks were continuing to ask questions with some challenging high balls and set-pieces into the FC penalty area, but the home side were resolute defensively, soaking it all up and still fashioning chances of their own when the opportunities arose. Tompkins pulled off his best save with another strong right hand diving low to turn another beautifully-struck drive from outside the box by James Hammond around the post. There was one final nervy moment for FC in injury-time when a rare error from Nick Henebery allowed a Hadley forward in behind, but Tompkins was quick to react and slid in with a great challenge just outside his box to keep his thoroughly-deserved 10th league clean sheet of the season intact. This latest win for FC closes the gap on Tring Athletic and Hadley to three points with two and three games in hand respectively still on the duo. London Colney will be another tricky hurdle to navigate when they are the next visitors to Langford Road on Saturday afternoon.